STATE COLLEGE, PA - Danny Hudzina smashed a two-run homer in the second to give the State College Spikes a lead they would not relinquish as they earned their second New York-Penn League title in the last three years with a 2-1 victory over the Hudson Valley Renegades in Game Two of the NYPL Championship Series on Monday night at Medlar Field at Lubrano Park. Hudzina's blast to left off Hudson Valley starter Travis Ott (0-1) allowed the Spikes to erase an early deficit. The Renegades struck first in the opening frame to plate a run on Jose Rojas's bases-loaded infield single. However, State College starter Jordan DeLorenzo shook off the rocky beginning to make the lead hold up through the rest of his four innings on the mound. DeLorenzo struck out seven batters and yielded a total of four hits, two walks and a hit batsman during his effort. Greg Tomchick (1-0) then delivered four scoreless, two-hit innings to earn the win in relief. Tomchick elicited 11 ground ball outs and walked just one batter to keep the Renegades at bay. Brady Bowen (2), who tied for the New York-Penn League lead in saves with nine in the regular season, then closed out the championship victory by striking out the side in the ninth. Ott took the loss for the Renegades after giving up a total of two hits and two walks while recording six strikeouts over four innings. Penn State product Jim Haley, who returned to Medlar Field at Lubrano Park for a second time as a member of the Renegades, went 0-for-3 with a walk. Hudzina also added a double to the State College offensive cause, while Jeremy Martinez's produced the only other Spikes hit with a third-inning single. Hudson Valley outhit State College on the night, 6-3, with Miles Mastrobuoni and Jose Rojas each contributing multiple hits. The Spikes' win enabled them to sweep the series in two games and clinch the NYPL title for the first time at home. State College's 2014 championship was won on the road at Tri-City. 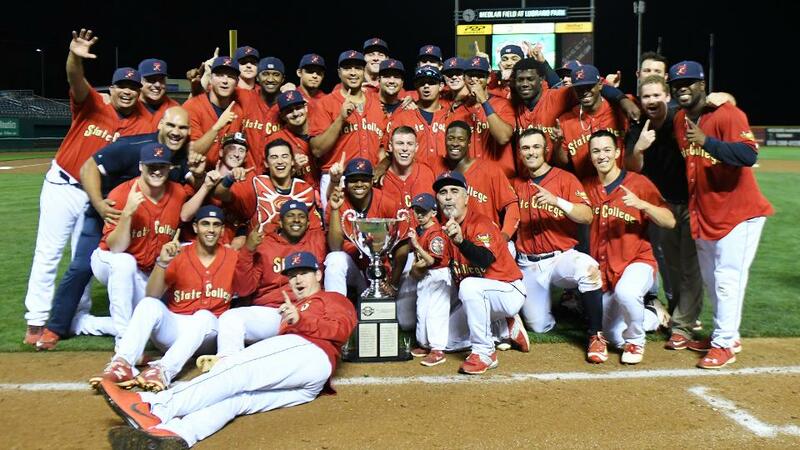 The victory also capped off a record-breaking season for the Spikes, as the club's 50 regular-season victories set a new team record, and Tommy Edman smashed the franchise single-season runs record by scoring 61 times. In addition, the Spikes broke their single-game attendance record when 6,111 fans jammed Medlar Field at Lubrano Park on September 4 for the regular season home finale. To find out more about 2017 Season Tickets, Mini-Plans, McDonald's Flex Books and a variety of group packages and experiences for the Spikes' NYPL title defense in 2017, call the Spikes at(814) 272-1711. Additional team and ticket information can also be viewed by visiting StateCollegeSpikes.com.